Our main task is to maintain your transmission in perfect working order so that you enjoy reliability, great fuel efficiency, enjoyable motoring and avoid costly overhauls and repairs. American and of course Australian vehicles. Most transmissions have mineral based fluids and servicing should be regular, usually every 20,000km to 30,000km. In Melbourne, average mileage is around 20,000km per year. It really is quite reasonable to maintain a transmission service period of 12 months or 20,000km and those that do experience trouble free motoring. Transmissions that require synthetic fluid are a little more expensive to service but the service periods are extended out to 60,000km to 80,000km. 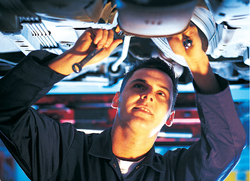 Transmission service prices are based on make, model and transmission version and vary widely. Call for an automatic transmission service price any time but be sure to know the year, make and model of your car.